Radical. That was the teaching of Jesus on the mountain. His sermon is a vast array of character building lessons awakening the eyes of the dull of heart Jews of His day. The response of the multitude was astonishment. They had never heard this kind of teaching from their own scribes. In one part of the sermon, Jesus contrasts the thinking of stoic law keeping to matters of the heart. It is easy to remember how to treat the evil person. If they hurt you, you hurt them. There was in the Law of Moses provisions for recompense but Jesus wants the people to listen to the heart of the matter. The Law was given as a schoolmaster bringing the Jews to Christ. God did not want the burnt offerings – He wanted their whole hearts. The attitude of the second mile would drive the lesson home. Evil men abound who take advantage of others. Often, because of the humble spirit of God’s people, they are taken advantage of by worldly-minded men. This would happen to the disciples of Christ but the reaction of His followers would be very different than the expected response. The child of God does not seek revenge when offended by others. Followers of Jesus Christ will not have a lynch mob mentality against those who do not love God. The figure of being slapped in the face is not a matter of physical abuse. Taking a tunic or cloak in a legal matter is of little consequence. Being pressed into service to deliver a dispatch would be done with a spirit of “how far do you want me to take the message?” The attitude of the second mile is not a restrictive spirit but a willing heart to serve others for the glory of God. Today the world is filled with injustices and difficulties. The idea of being pressed into service is not so common but the attitude of the heart is still needed. Christian’s are people who do more than others do because they serve the Lord. Their heart is filled with a benevolent spirit of kindness, gentleness and an attitude of going the second mile. Evil men abound and hearts that are willing to do more than expected need abound in the body of Christ. “What more can I do?” should always be on the lips of the people of God. There is much work to do for the kingdom of God and we must always be ready to put our shoulders to the task with diligence. The world can be a hardhearted world but the children of God season their communities with the grace of the lives. Jesus declared in the sermon on the mount that His disciples are lights to the world and like salt, seasoning to the influence of others. 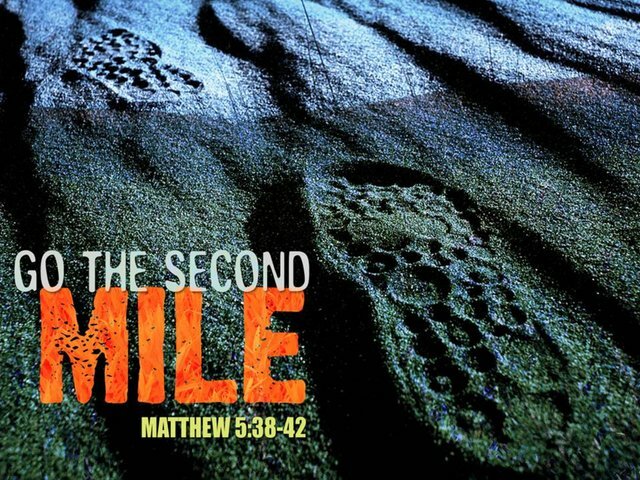 Going the second mile for others is how we show that grace in our lives. Jesus set forth high standards for His disciples in His sermon. What is important to remember in His teaching is that Jesus never asks us to do anything He was not willing to do Himself. When it comes to the attitude of the second mile, go to Golgotha and see the suffering Savior on the cross. He did not go the second mile. He went all the way to the throne of His Father for you and for me. Can we do any less with our fellow man?